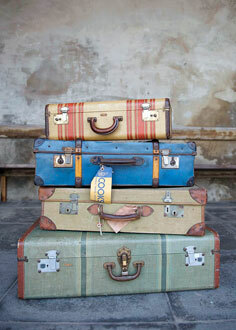 The best luggage size for you depends not only on where you are going and for how long. It also depends on what kind of a traveler you are. Some people prefer to travel light and manage to do so no matter where they are going or for how long. Others (including us) are always struggling to with staying within the airline luggage restrictions. However, what you need to pack can vary greatly from one trip to another. Most of us therefore own more than one piece of luggage. Luggage is usually described as small, medium, or large. But what does that really tell us? It can vary between manufacturers in which group their luggage falls, but most fall in the following length categories. Carry-on luggage falls under the small category while medium bags are suitable for one traveler on longer journeys or two travelers on shorter trips. Large luggage on the other hand is ideal when many people are travelling together, e.g. families with young children (when having to maneuver as few pieces of luggage as possible is highly beneficial). Luggage dimensions are usually shown in inches. These are external measurements, meaning the internal storage compartment is slightly smaller than the inches listed. Luggage is measured from the bottom (of wheel, standing pegs or flat bottom) to the top of the retracted handle. Most airlines allow adult passengers in economy class to take on board one piece of hand luggage and one personal item (handbag or laptop bag) free of charge. Most airlines state the maximum combined luggage dimensions allowed, i.e. the figure you get when you add all the dimensions together (length + width + height). As long as your carry-on luggage is within these limits, you should be safely within the luggage restrictions of most airlines. However, there are exceptions and the so-called low cost airlines tend to be stricter than those that offer higher service level. Always check your airlines luggage rules before leaving your house. You can find more information about Carry-on luggage restrictions on our sister website, Top Travel Tips. The same applies about the size of your check-in luggage, it must comply with your airline luggage restrictions. Most airlines allow one check-in bag free of charge but more and more airlines now charge for all check-in bags in economy class. You can find more information about Check-in luggage restrictions on our sister website, Top Travel Tips. Portable luggage scale is excellent travel companion for those that struggle with packing light. Using luggage scale to weigh your suitcases before heading to the airport could save you substantial amounts in overweight charges. The weight of your luggage is though likely to be more of a problem than your luggage size. Most of us manage to fill whatever luggage space we have available, often beyond our airlines luggage allowance.